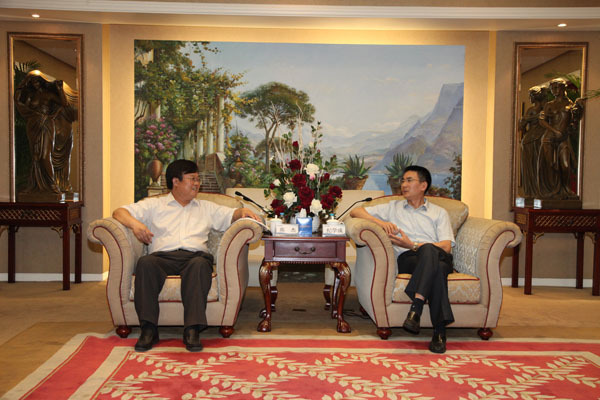 President Ji Xuecheng met with Chen Jie, Vice Mayor of Liuzhou and Gu Zhangwei, Director of Liuzhou Municipal Commission of Commerce at the meeting room of 25th floor on July 9th, holding a friendly talk. Sha Fei, Vice Minister of Business Management Department of SINOMACH attended the meeting. Vice President Jing Yongjian, Deputy Secretary of CPC & Secretary of Discipline Inspection Committee Peng Mingjing, Vice President Wen Yimei joined the meeting together with heads of concerned departments. In the meeting, Vice Mayor Chen Jie and Director Gu Zhangwei gave a high praise to Beijing Unite-Idea Advertising Co., Ltd. (BUIACO), which is a subcompany of CNAICO. The inaugural Liuzhou Auto Exposition held at the end of 2011. Although the infrastructure of the expo was not so good, BUIACO built an excellent team and overcame all difficulties, completed the construction and the management of the expo, ensuring the successful holding of the expo.